There’s nothing more annoying than unpleasant odors that linger around your home. Especially, the damp musty kind. Nobody likes being in an area that smells like a pack of wet dogs slept on your couch all day. This type of smell more often than not, the culprit lurks below your main floor. That’s right, in your basement. To make the problem worse, the basement can make the rest of your home smell musty too. It’s called the ‘Stack Effect’. Warm and musty smelly air from the basement moves upwards naturally and the upper layers of your home can absorb at least 50% it. Do you want to know how to resolve the musty smell and improve the indoor air quality of your basement and the rest of your home? Next we will walk you through the exact steps that will help you rid your home of musty basement odors and keep them from coming back for good. Typically there is 2 reasons why your basement has a musty smell to it. Water or moisture is causing mildew or mold to grow. The basement can be dark, humid and possibly even wet due to some perpetual hidden source of water. It makes for the perfect combination for mildew or even mold to grow and these scuzzy, slimy fungi can spread faster in your home than crabgrass on fertilizer. It’s icky, causes allergies, sends invisible spores floating into the air you breathe and in extreme cases it can fill your home with toxins and make your sick. Nasty stuff that’s for sure. 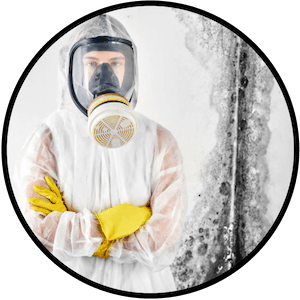 And if you are like most people, you’ve heard that the dreaded “Black Mold” is a serious health concern and you are wondering whether you need to rip the entire house down to get rid of it and that smell. Or possibly hire a professional mold remediation company to ‘professionally’ remove nasty odors. The basement also makes for a perfect hiding spot, home and breeding grounds for animals including rodents and other pests. These animal infestations can mean musty odors from their general presence, urine and droppings, nests and even rotting bodies of dead pests. Wild animals and pests belong outside, not in your home. Eliminating their presence in your home is mandatory if you want to get rid of the musty smell and avoid any respiratory or other health issues associated with them. First let’s talk about mildew & mold. Ok, so let’s start with clarifying the difference between mildew and mold. Mildew is actually a form of mold. 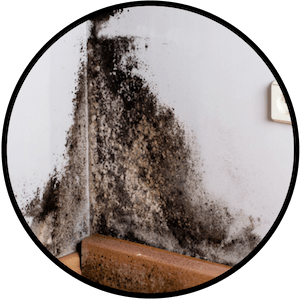 Without getting too deep into the differences, at a high-level, mold is generally more dangerous to your health and mildew is more of a cosmetic problem. But both can cause your basement to smell musty and need to be removed. And in this article when we refer to mold or mildew, it could be either. Now let’s get back to how to remove them. Do you see black, white or green patches growing on the floor, walls or ceiling? Well, it’s established that you are dealing with mold. But what we do not know is how severe the infestation (we like to call it that) is. What’s visible might be the tip of the iceberg. Mold likes to hide in places that are oblivious to sight, like tiny crevices in the wall or in your carpet. If you are lucky, it’s just the circulation of warm air in the house that’s causing condensation on the walls in the basement resulting in an increase in moisture. But if that’s not the cause, then you have to play detective and rule out all possible causes one at a time. A crack in the foundation wall, a window seal that’s broken, a leaky pipe or even a laundry vent that’s fractured. The source of the moisture can be anywhere. Most types of household mold can be eliminated by yourself with some patience, some elbow grease and some basic tools that can be found around home. But first, we need to be aware of what we are up against. Take a quick tour of your basement and the sources of mold and mildew. No matter how small it is, a leak in the pipes can trigger a domino effect that causes a barrage of problems, starting with the most obvious one, an increase in the relative humidity levels in your home. If left undetected, water starts to find its way into everything. It can damage the flooring, the walls and even cause structural damage. The problem though, is that finding a leak isn’t as simple as it sounds. There can be a labyrinth of pipes in your home. A lot of them can be concealed in walls or hidden behind woodwork. If you find a puddle of water under the pipe, it might just be condensation that can be fixed by insulating the pipe with foam. Try it. Does the leak stop? If not, then it means that you have a leaking pipe either inside or outside your home. Start with the toilet. Leaking toilets are sneaky. The leak often goes undetected, because on most occasions, it’s a feeble dribble. Along with a visual inspection of the toilet bowl, listen carefully for sounds of dripping water. You can also add a few drops of food color in the water tank and see if it makes its way into the toilet bowl after a while. If it does, you might need to replace the flapper or the valve in the flush. Check if there are any leaking faucets. A quick washer replacement ought to fix them in most cases. Or else, the faucet may have dislodged or may have been installed incorrectly demanding a more thorough repair procedure. If you find that the flooring under the bathtub is flaking or bubbling, you might have a leaking bathtub. In most cases, a layer of caulk around it fixes the problem. If the leak is from within the tiles, you’d have to cut a hole in the drywall and peep behind it with a flashlight to gauge the severity of the leak. Labor intensive, we know. But sadly, there’s no way around this. Now work your way from the bottom of the house and check each pipe as you move upwards. Since you have the main water supply shut off, there shouldn’t be any gurgling or dripping noises. Check wooden cabinets for signs of water damage. That indicates a leak in the pipes behind it. Check the spigots outside the home for leaks too. Minor leaks can easily be fixed yourself. However, if it involves replacing a pipe and you are not sure about doing it yourself, then hire a plumber. The expense will be a lot smaller than what water damage can cause to your home in a few months. The drainage system in your home is supposed to send water outside. If it’s doing the opposite, then it indicates a clog in the sewer line. You can stave off long-term problems by listening to your house though. If you are hearing gurgling noises as the water goes down the drain, then it means that dark clouds loom over the horizon. It can be an isolated block in a secondary line, like the sink or the bathtub. Or, it can be much worse, a clog in the main line which will cause water to back up from everywhere whenever you use water. You can take remedial action once you have detected the clog. Secondary clogged drains can be cleared easily by releasing the pressure. You can use a sewer clean-out line. If there’s more stubborn debris causing the clog, then you might have to use a plunger or a snake rod to try and clear it. Professional sewer line cleaning companies typically use an electronic version of the snake rod which is pretty effective, unless the entire main line is blocked by tree roots or something similar. The last stage is a camera inspection in which an electronic camera is snaked into the entire line to check for the block. Basement windows have earned a notorious reputation off late. That of being a constant, niggling source of groundwater and energy leakage. That’s partly due to poor design and the rest due to poor maintenance. In many old homes, basements were never designed to be livable spaces. So contractors would often cut corners while designing the window frame or sealing the windows. The first sign of a basement window leak is a puddle of water on the floor every time it rains or snows. The water might appear to drip down from the walls or the ceiling. If the leak is a recent one, then a simple layer of caulk should be enough to stop it temporarily. However, if you have been procrastinating the repair and relying on towels to absorb the dampness for a while, then you might have to inspect the window frame for signs of rot. Old wooden frames might need to be swapped with new ones. Inspect the window wells to see if they are clogged. If there’s no gravel in the window well, add at least 2 feet of gravel that’s ½ inch in size to allow water to drain away from the window. Connect the drains with the main foundational drains. Use window well covers to reduce the amount of debris and water that makes its way into the well. You have tons of options to choose from when it comes to window well covers. Inspect the downspouts and gutters to see where they drain. Sometimes, downspouts can get clogged with leaves and debris which can cause water to spill outside. You can also use downspout extensions to divert the water further away. If nothing else works, then you might have to replace the window. If the local building codes allow it, then you can swap the rundown window for an egress window. A crack or two in the foundation is usually not a cause to lose sleep over, especially if it’s the non-structural variety. But even the tiniest crack is an inlet for rainwater or melting snow into your basement, inviting a horde of health problems from mold growth. 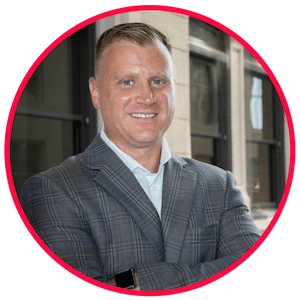 Further, if left unattended, even that hairline crack can start widening causing more severe problems down the road, that can cost you tens of thousands of dollars to fix. The first step is to determine the type of crack. Vertical cracks are common and these are usually of the non-threatening type that can be fixed at home with a professional foundation crack remediation company. You should only attempt to fix it yourself if it’s a vertical crack and you are comfortable with the process. These can be fixed with a simple epoxy solution or polyurethane that permanently seals it. Once the crack is fixed, you must monitor it constantly and prevent water from damaging it again in future. Check the gutters for clogs that may be diverting the water directly over the foundation. Check downspouts for debris and use downspout extensions to divert the water away from the foundation. Stagnant water around the house, be it in the yard or around the foundation is nothing but trouble. When the soil gets saturated, the water makes its way into the basement through foundation cracks. If nothing else, it harbors bugs and crawlies that you’d hate to find around your home. Sometimes, the problem is caused by clogged gutters and downspouts, which makes it an easy fix. Clear the clogs, install downspout extensions and you are done. In some situations, you may have to grade the yard or install an underground drainage system, both of which are expensive repairs for an existing home. Speak to a contractor who will inspect the grade of the yard and determine whether it needs to be altered. A 2 percent grade usually suffices for most homes. That might not sound like much but it requires raising the existing grading by adding topsoil. However, if the existing grading is within the mandatory 6-inch distance from the siding, then it would be impossible to raise the grade. The contractor may suggest creating a series of shallow trenches called swales, which will help to divert the water away from the foundation. For homes that are positioned at the bottom of a slope, a trench drain, which is like a moat that sits in between the slope and the foundation, is a great solution. Now that we have ruled out (and fixed) most of the problems around the house that can contribute to mold, it’s time to step into the basement. If there are visible signs of mold and mildew in the basement, then it warrants a more thorough investigation. Start with the carpet. Mold has a very distinct musty smell that’s unmissable. Just put your nose to work and inspect the carpet closely. If you smell it, but do not see any visible mold spores, then the growth might be under the carpet. An area rug can be flipped over and checked. But if you have a carpet that extends from wall-to-wall, then hire a professional to lift it up and check below it. Pro Tip: Basements and carpets usually don’t mix unless you are diligent about maintaining the humidity levels, which most homeowners are not. So, get rid of the carpet in the basement and install tile or another appropriate flooring material. At best, carpet is a magnet for dirt, dust, dander and whatnot. Drywall is made of gypsum which means that it is crammed with cellulose. In other words, that’s an endless supply of food for mold. In case of mild mold infestations, ventilating the basement should suffice to dry the drywall. However, if the mold has spread, then you have no other option but to cut out the infested section of drywall and replace it. On the ceiling, if you see bubbling or peeling paint, then it indicates moisture. It might also mean that mold is growing in a hidden cavity behind it or inside the wall. Wallpaper glue has enough organic material to sustain mold growth. So does insulation. All those moving boxes you still have stacked in your basement can be a big problem too. Porous surfaces like corrugated cardboard boxes can be a haven for mold because they tend to absorb moisture from the surrounding. If your basement flooring is damp, then the bottoms of the cardboard boxes can get infested with mold. Check all the boxes and separate the ones that are moldy from the rest. Salvage what you can, discard the rest and elevate the non-infested boxes, off the floor to ensure that the mold doesn’t spread. Do you have fabric or furniture in your basement that could be getting wet? Chances are that it might be harboring mold spores, especially if you are already dealing with a severe mold infestation in the house. Fabrics made of organic materials like cotton, wool and silk are most vulnerable. But even synthetics can sometimes allow mildew and mold to grow. Thankfully, the fix for removing mold off fabrics is simple with a good cleaning or if it is really advanced you should just discarding everything that has mold growth on it. Household vinegar can kill almost 82% of all mold species. As a bonus, it deodorizes the fabric. Add a cup of vinegar to the wash cycle in the machine and let the clothes dry in the sun. You can also use bleach, provided the fabric doesn’t leak colors or fade when exposed to it. To be doubly sure, do a ‘bleach test’ by rubbing a solution of bleach and water in an inconspicuous part of the fabric. If it passes the test, add a cup of bleach to the wash cycle and sun-dry the clothes. You can also use Borax or buy a detergent with Borax in it to remove mold. Use hot water to wash the clothes whenever possible as it is more effective in mold removal than cold water. Sun exposure helps to kill any pesky fungi that might have survived everything else. Once you have plugged all leaks, eliminated all sources of standing water around the house and fixed all clogged drains, it’s time to test the relative humidity level in the basement. Mold and mildew can thrive when the relative humidity level is above 80%. In an ideal setting, the humidity in your home should be a tad below 60% during summers and just below 40% during winters. To check this, buy a hygrometer. It’s a simple device that will analyze the humidity level and show you a reading, typically a percentage value that allows you to ascertain whether you need to use a dehumidifier. Our Recommendation: If you want to check out the BEST dehumidifiers you can buy to run in your basement or anywhere else in your home, check out this list on Amazon.. Mold rarely grows in air ducts. But with water damage and constant leaks, you never know. It’s a sneaky little fungus that likes to hide. And an air duct is as good as place as any. You can do the simple ‘sniff’ test to see if you can pick up the musty, moldy odor. If you do, see if there are visual signs of mold. If the answer to either of these is yes, then you have two options. You can hire a professional mold testing company to confirm your doubts, before you go to the remedial part. Or you can skip the testing part entirely and hire a duct cleaning company to get rid of the mold. Dryer vents are the perfect environment for mold to grow. They are warm and damp and if you suspect that it’s harboring mold, then it probably is. Check the area around the dryer. Unplug it, pull it out and check behind it as well as underneath it. If there are any patches of mold on the wall, treat it (more on this later). Unplug the vent hose to check for any moldy lint. Vacuum it out. Clean the lint trap with hot water, bleach and vinegar and allow it to air dry. On most occasions, a piece of cloth or lint that has gone moldy is the culprit. As a preventive measure, you can also scrub the entire dryer (inside and out) with a solution of hot water mixed with vinegar or bleach. Preventing water from entering the basement and fixing all possible leaks is one thing. But removing mold and mildew completely from your home is a different ball game altogether. Especially, if you are dealing with a severe infestation. Nevertheless, we are gonna try. If the infestation is limited to a small area on the walls, in the bathroom or in the siding, then mix bleach with water in a 1:8 ratio and scrub the surface with this solution until the spores are dislodged. Now open the windows or use a fan to dry the wall. Wear protective clothing at all times. If you have an infestation under the carpet, then cut it into small manageable pieces with a utility knife. Seal off the entire room with double plastic sheets. Install the box fan on the window to draw the air outside. Moisten the area under the carpet with the garden sprayer. This will prevent the spores from spreading in the air. Now double wrap the carpet pieces in the 6-mil plastic and double bag them in garbage bags for disposal. If you have moldy walls, then you might have to pry the baseboards and trims using a pry bar. Shut off the main power supply. Cut open a small section first and locate the wiring. You don’t want to cut into it. Now start cutting the drywall and check how deep the mold has spread. Many a time, homeowners are shocked to discover the extent of the infestation into the insulation. Remember, you are going to repair the wall anyway. So don’t hesitate to cut open a little more than what’s required. You don’t want even a small patch of mold to remain. Mist all the infected insulation and drywall and double bag it for disposal. Rotted wood must be replaced when possible. Or else, clean it and treat it with a wood preservative. Now fix it up with new lumber. Once all infected material is safely double bagged, vacuum the room completely using your dry/wet vacuum. Dispose of the filter after use and scrub the remaining attachments in bleach and water. Use mold cleaner and scrub all the surfaces until the mold spores are removed completely. Now allow it to air dry for three to four days. Open the windows. Let in the sun. Once the wooden surfaces are dried, use any oil-based sealant like KILZ, for example, to seal it. Repaint the wood with any paint that has a mildewcide in it before you reinstall the insulation and drywall. You can use natural deodorizers to remove any remnants of the odor that may be clinging on to the furniture. An open bag of charcoal can work wonders. So can a mixture of vinegar and water dipped in cotton balls. These are only temporary fixes though. Mold and mildew are not the only cause for a putrid, stuffy smell in the basement though. Animals find basements as alluring as mold does. There’s zero interference from pesky humans. There are tons of places to hide, nest and roost. There’s an endless supply of food close by. If it’s a rodent, then it will enjoy a free run and create a labyrinth of pathways inside the walls that it can zip in and out of. That’s until it falls dead one day. And it starts to rot sending a reeking smell throughout the house. Here are some tips to detect and remove an animal from your basement. If it’s a roof rat or mice, then you will hear scratching noises in the walls at night. If it’s a squirrel, then the noise can be heard during the day. Look for droppings around the home. Plastic, wires or insulation will look like it’s been gnawed on. A strong putrid smell of urine and droppings. Now let’s see how to discover if you have a dead animal in the wall. Remember, they could be anywhere in your house and not just your basement! If you are dealing with a raccoon or an opossum, then it’s recommended that you hire a wildlife pest removal service to have it professionally removed. For all you know, the nest might have babies. And raccoons can be fiercely protective when nesting. For mice and rats, most homeowners use baits and rat poison. That’s not recommended at all. Not only does it increase the risk of the rat dying inside a wall, it can also be harmful for non-target animals like pets. If the house smells like a dead, rotten carcass, then unfortunately, the sniff test is the only way to find it. Try and narrow down the location of the smell to one part of the house or a single room if possible. Wear protective gloves, goggles and a respirator or a mask. Crawl into the attic just above the room where the smell is the strongest. Now sniff as you move forward and back to try and find the exact source of the smell. Keep your nose on the wall and sniff around the drywall until you find a spot where the smell is the strongest. Cut out a small section and peep inside with a flashlight to see if you can find the dead rat. Remove the carcass, bag it and discard it safely. Check the area for maggots. Use any enzyme-based cleaner to clean the area and remove the smell. Leave a few vinegar bombs in there to deodorize it. Further Reading: Having rodents, critters or other pests in your home is never a good thing. Be sure to check out our detailed guides below on removing and controlling pests in your home. Let’s go through that once again for a quick refresher. This doubles up as a checklist to keep musty smells from coming back into your basement. Check pipes for leaks and fix them. Check foundation cracks and seal them. Remove any source of standing, stagnant water around the home. Check walls, drywall and ceiling for mold. Check cardboard boxes and fabric. Use a hygrometer and check the humidity levels. Use the steps mentioned in the mold removal section. Remember, even if you have fixed all of the above, the mold will return if the moisture returns. So, preventive maintenance is the key. Keep water out of the house and humidity levels low and you should be fine. If you live in an area with excessive rains or snow, then consider running a dehumidifier during the wet season. It will help you maintain the relative humidity inside the home and prevent the problems that come with it, especially mold and mildew. On bright and sunny days, let the air and sunlight in. Throw open those windows. It will keep the basement dry and help dissipate any lingering odor. To keep animals out of the basement, plug all entry and exit points. Do not keep your pet food and water outside. Remove any debris from gutters and downspouts that might be clogging them. Keep food locked in airtight containers. Fix any leaking spigots to stop the water supply for critters. Further Reading: Finding and eliminating the source of musty smells in your basement is only piece of the puzzle to ensure your home smells it’s best. If you want to form a comprehensive approach to improving your home’s indoor air quality, check out these articles next. You have successfully completed reading the “homeowners survival guide to invading fungus and critters”. We hope that it helps you keep your home smelling fresh all the time. If you have something to add to this, then please share it with us in the comments section.